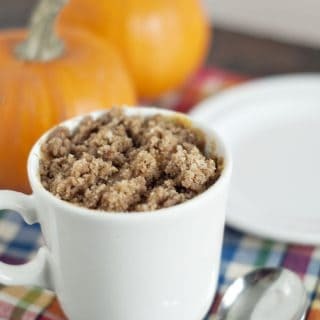 Just like the original (coffee cake in a cup), this Pumpkin Coffee Cake in a cup is the perfect remedy for your sugar craving! 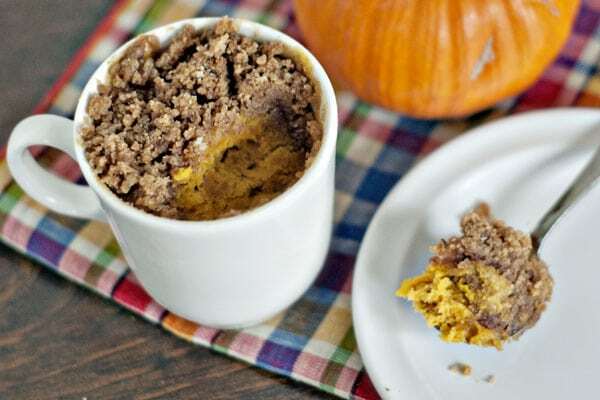 If you’ve tried other coffee mug cakes and weren’t sold, you have to try this pumpkin version! It takes about a minute to bake in the microwave and about that much time to mix it together. It’s fluffy, light, and has an irresistible streusel topping! Well, howdy! I don’t know about you but I’ve been in a turkey/roll/butter/pie-for-breakfast coma for the past 2 days. I figured it was about time to check-in and make sure that you had a great Thanksgiving. And, what a better way to check in than to share with you a recipe for cake in a cup a day after you’ve likely vowed to watch what you eat from now until Christmas. You’re welcome. My concern for your well-being just exudes from me, doesn’t it? I love you, really I do. See that streusel? It’s calling for you. Sharing streusel this good and easy only occurs when you really love someone. 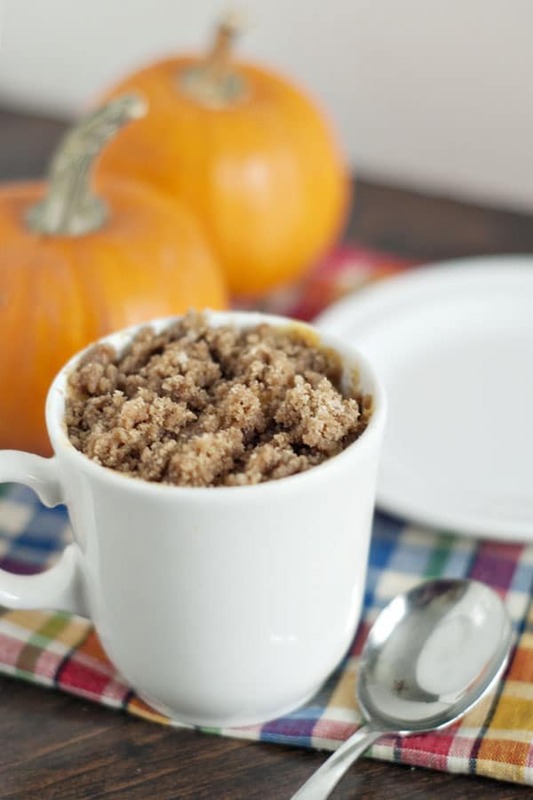 My original coffee cake in a cup is one of the most viewed recipes on HLF. 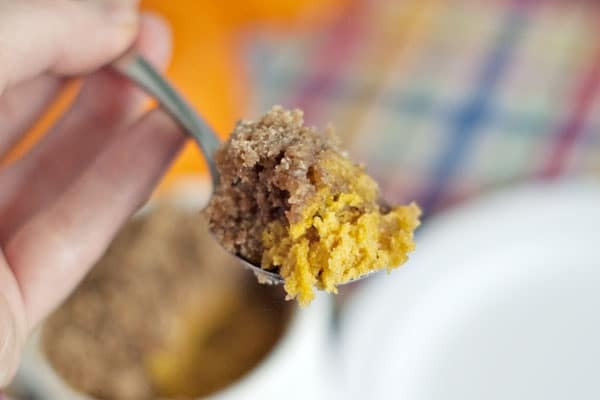 For this pumpkin version of a coffee mug cake, all you’ll do is swap the applesauce for some pumpkin puree, throw in a pinch of ground cloves, and voila! You’ve got yourself a warm, autumn-spiced coffee cake in a cup for one that is ready to eat in just a few minutes. If you’re more in the mood for something chocolately, check out this hot fudge cake in a cup recipe. Dangerous? Yes. Totally worth it? Absolutely. Get those coffee mugs ready! In a mug soften 1 tbsp of butter in microwave, about 5 seconds. You don’t want it melted, just soft. Stir in 2 tbsp of sugar and mix until well incorporated. Stir in pumpkin, vanilla (just a tiny bit, we’re talking drops), flour, baking powder, and pinch of salt and cloves; stirring until just combined. Use the back of your spoon to smooth it out in the bottom of the mug. Want struesel? Of course you do! In a separate, small bowl, combine 1 tbsp of butter, 2 tbsp of flour, 1 tbsp of brown sugar, and ¼ tsp cinnamon. Use your fingers to to pinch the butter and mix it in with the other ingredients. When it starts to look like lumpy sand (appetizing, eh?) and all ingredients are combined, pour on top of cake batter in mug. Cook in the microwave for 50-80 seconds depending on your microwave. At 1 minute, my microwave cooks it perfectly. It will look just barely set on top. You don’t want to overcook it and things tend to get ugly fast in the microwave. I suggest cooking it 50 seconds, and then in 10 second intervals checking after each interval until done. Eat white it’s still warm. Once it cools off, it tends to loose some of it’s magic! I cannot wait to try this as I am a huge fan of anything PUMPKIN AND THANK GOODNESS FALL IS (I hope) JUST AROUND THE CORNER!! I do want to try the egg with it also as I need protein in everything I eat. So happy that I stumbled across your recipe’s! Thanks for sharing!! How did it work with the egg? Kinda want to try that too, but not confident in my experimental baking skills enough to try lol. I love these artlices. How many words can a wordsmith smith? My boys and I love this cake! We have made it three times. Delicious! I tried this with, and without, a touch of egg and it was good both ways. I preferred the more cake-like texture I got when I added 1 tsp. of egg beaters, however. I also preferred my streusel topping with dark brown sugar, and a touch less flour. Just made this and it was amazing. I am in love! This is great! I have tried several different pumpkin mug cakes and this is hands down the best. I think it’s the streusel topping that sets it apart. Thanks for sharing. I would love to write a post and link my readers to your recipe, if that’s ok with you. Just let me know. Thanks! Ok I have to admit I was a skeptic. But I was craving a ‘fall’ type dish and found this one. I believe! I believe! I believe! I believe! I am just shocked at how yummy this was! The only thing I changed was instead of flour being added to the streusel I added quick oats instead. Now I’m very excited to try many of the others. Thank you for taking the time to research and post these recipes and photos. Outstanding job!! I just made this tonight. I added an egg since most mug cakes call for one and I expected it would have one and I heaped the pumpkin (and added some nutmeg and ginger). It was delicious with a small scoop of vanilla ice cream. My husband took a bite of mine and was quite happy when I offered to make one for him. I just bookmarked it and will definitely be making it again. Thank you! Glad you liked it. I keep the egg out as I feel like it makes them too rubbery but if you liked it, awesome! This knowledge could be dangerous 🙂 What a great idea! Hi Sarah! So glad you tried the cake- it’s dangerous, huh? Thanks for sharing the recipe too!